A slowdown in market volatility helped to lift the Spectrem Investor Confidence indices in February, The Spectrem Millionaire Investor Confidence Index (SMICI®) rose 5 points to 2. The Spectrem Affluent Investor Confidence Index (SAICI®) edged upward 1 point to -3. This was the second consecutive month in which both indices were in neutral territory (10 to -10). Instituted in February 2004, the indices measure the investment confidence and outlook of the 16MM households in America with more than $500,000 of investable assets (SAICI), and those with $1MM or more (SMICI). This month’s survey was fielded between Feb. 16-17. Market volatility had calmed after the S&P 500 and Nasdaq dropped to multi-year lows earlier in the month. Both indices are down dramatically from the same period last year. The SMICI is down 11 points from February 2015, while the SAICI is down 15 points. We find marked investor confidence gaps when the indices are analyzed by gender and political affiliation. The SAICI for women was at -10 in February. For men, it was at 1. The SMICI for women was at -4 compared with 5 for men. The SAICI was also higher for Affluent investors who identify as Republicans. In February, it was at two, compared to -3 for investors who identify as Democrats and -6 for those who identify as Independents. The SMICI was at 4 for investors who identify as Republicans vs. 2 for those who identify as Independents and -2 for those who identify as Democrats. One of the positive drivers of the February indices were the findings of our monthly survey we conduct with Affluent investors about how they would invest in the coming month if $100,000 was made available to them. In February, “Not invest” was at 34.40 pts., down from 36.80 in January and a six-month low. Analyzed by wealth segments, our survey found that “Not invest” among non-Millionaires was at an 11-month low and a five-month low for Millionaire investors. Another positive driver for the indices was a gain in the Spectrem Affluent Household Outlook, a monthly measure of confidence in four financial factors that impact Affluent households’ daily lives. 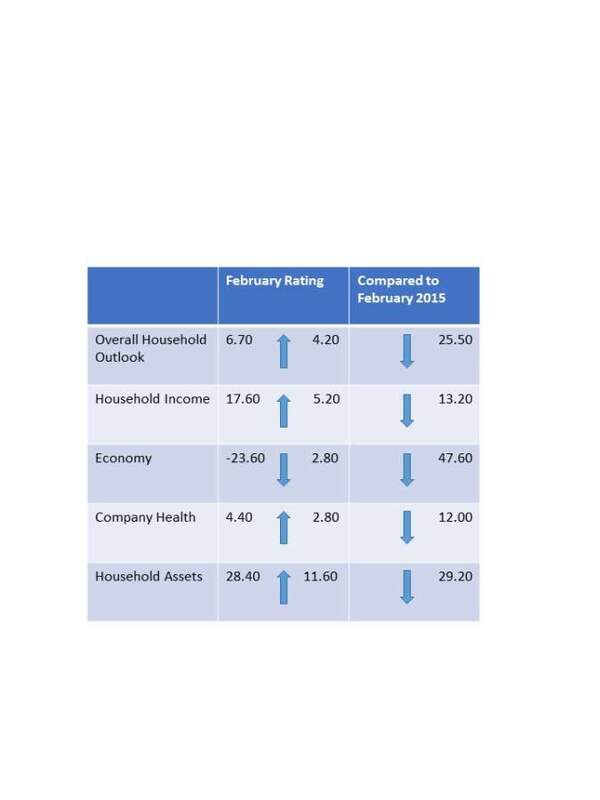 In February, the Outlook gained from the previous month in the areas of Household Assets, Household Income and Company Health. One drag on the overall Household Outlook was a decline in confidence in the Economy. For non-Millionaires, for example, their outlook on the Economy dropped in February to its lowest reading since November 2012. Once again, we find a marked Household Outlook confidence gap between men and women. The Outlook for Affluent women was at 2.08 in February compared with 9.04 for men. Unlike the indices, it was investors who identify as Democrats who indicated a higher degree of confidence in their Household Outlook than their Republican and Independent counterparts (10.48 vs. 3.69 and 9.14, respectively.